Most garden railroaders keep their trains inside between running sessions. This means that they have to figure out how to get their trains on the track when they want to run them. And they have to have a place to keep them safe and dry when the trains aren't going to be used for a while. This article contains some suggestions for storing your trains between sessions and for making them easily available when you have time to run them. Although garden trains are built to handle exposure to the elements, they will last longer if they are not unnecessarily exposed to hte elements when not in use. Chances are weather where you live only allows you to actually run your trains for several months out of the year. So prolong the life of your trains by keeping them away from temperature extremes and high moisture while they are in "storage." 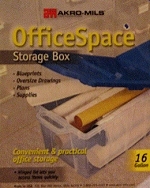 Where you store them depends on your living situation, of course. 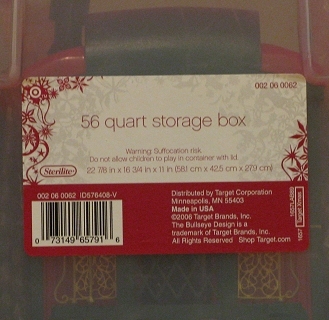 But don't let the bulk of the boxes keep you from finding a safe place for your trains. If you want to keep the boxes in the attic, you can, but don't keep your trains up there in hot weather if you can avoid it. The fact is that if you really use your trains (instead of just collecting them), separating your trains from their boxes is recommended. Storing trains without boxes is easier on you, takes less room, and is usually safer for the trains in the long run, as you'll see presently. If you use indoor storage tracks for longterm storage, you'll want to have some way to keep the dust from accumulating, such as a long sheet of cloth or mylar that you can drape over them when you won't be running them for a while. Of course, you still need to get your trains from the permanent indoor storage area to the outside. That's what the rest of this article deals with. One of the best solutions is to have indoor storage on "live tracks" so you can run your trains into the house when you're done. This may presuppose that you either run short trains or that you have several turnouts inside so you can divide the train up manually as it comes indoors. If your track is at ground level, you may be able to run it right into the basement and have storage tracks up along a wall somewhere. 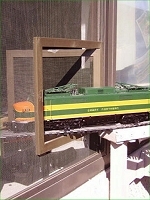 Many garden railroaders have partially replaced their old basement windows with a glass block solution that includes a "plug" that they can pull out to let the trains in and out. If your track is raised, you may be able to run it into the side of a train shed or other storage area. 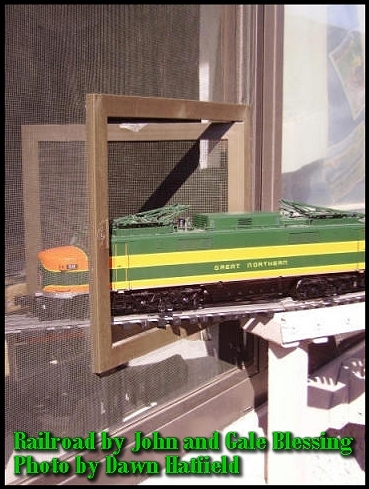 As an example, the photo to the right shows a train from John Blessings' O Gauge Outside railroad leaving the railroad for indoor storage. 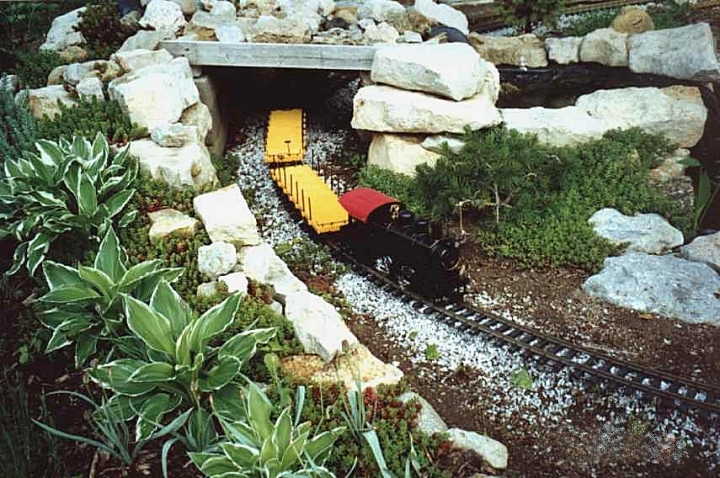 When the trains have all been driven "home," John takes up the piece of track connecting the storage area to the outdoor railroad and closes the little door to keep varmints out of his house. 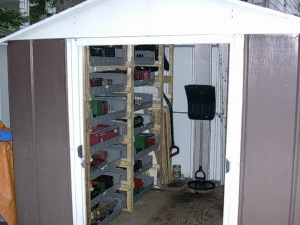 If the storage shed is not adjacent to the railroad, you may need to have a "drawbridge" or some such to carry the train indoors. As another example, the remarkable trestle in the title photo of our Primer page actually connects Denny and Judy Lamusga's railroad to their train shed, which is several yards away. Having them ready to go quickly you turn on the power. 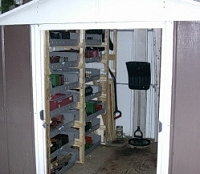 Below-Deck Storage - A number of friends have storage areas under a deck or porch where they can store the trains between sessions. If you try this with a deck, you should install something to shunt the water coming through the deck to either side of the trains, without creating a structure that traps moisture either in with the trains, or beneath the deck boards. As an example, the New Boston and Donnels Creek (my railroad) has a short tunnel/waterfall section that I created by fastening together a bunch of 2x12" boards cut like pie pieces and covering with vinyl pond-liner material. I rested it on solid concrete blocks, ran the track underneath it and ballasted the track. So there is about a 40" dry "roof" over one part of my railroad (although it does have a dirt floor). I have experimented with leaving short trains in the tunnel, or leaving the locomotive in the tunnel and the rest of the train outside. That worked well for a train that consisted of a Lionel Atlantic pulling two Aristo Sierra coaches, until the constant exposure to the weather caused the springs on the coaches' trucks to rust up and the coaches' vinyl handrails to disintegrate. :-( The locomotive is still fine, as are the other pieces of short trains that I've been able to fit completely inside the tunnel for weeks on end. I have a more prosaic solution - one of those barn-shaped mailboxes that the door broke off of years ago. One summer, I set it over the end of a siding and kept an AristoCraft Eggliner in it all summer long. Outside of filling up with leaves, which then laid up against the Eggliner and caused some temporary stains, the mailbox did a good job of protecting the little piece. I don't know how well a less sturdy locomotive might have held up. With both ends knocked out of the mailbox, it could stand in for a covered bridge, I suppose, and work even on loops without a siding. The old AristoCraft covered bridge (not currently available) would probably serve the same function. Another practical means to keep your trains close at hand is by using a storage bench like the Suncast Patio Bench shown to the right. 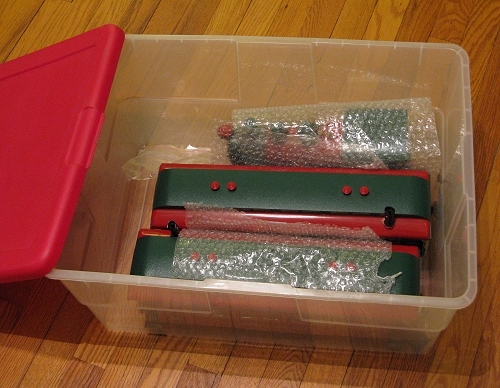 Obviously you don't want to toss your trains into the thing like toys into a toy chest, but the larger ones have enough room to accommodate trains set into home-made "trays" or small purchased storage containers. 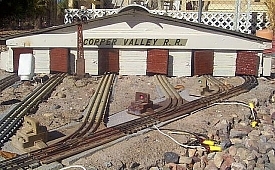 I don't use one of these for my trains, as there's no good place to set it near my railroad, but I have a couple "backless" ones that I use to keep some of my accessories and "yard art" in over the winter. Even if you have a good arrangement for getting trains on and off of your railroad, you may need to take a train somewhere else for some reason, such as a club meet or public display event. Although I set up a lot of temporary display railroads, I also need a transportation system that works for getting trains outside on days that I want to run "serious trains." So I've developed a system that works for both purposes. Bag the Boxes - First of all, recognize that the boxes these trains come in are designed to protect them from damage during overseas shipment. They are designed to hold the piece in a stable position, not to make it easy for you to get the pieces in and out. In fact, most of them will eventually either disintegrate or, worse, cause harm to a car or locomotive if you continue to get the thing in and out of the box every time you run trains. If nothing else, it takes a lot of time to get trains out of and into the manufacturer's boxes without marring them or breaking off brake wheels or something. Back in the 1980s, one of the first garden train "open railroads" I visited actually consisted of me watching a couple people unpacking cars from boxes. They eventually got a 30-car train on the track at about 2 minutes a car - you do the math. And once the trains were actually running, there were boxes all over the fellow's yard and porch, not exactly a natural or attractive part of the picture. Note: If you're a collector with a valuable LGB collection, save the boxes in a dry place. In my case, I only have space and energy to keep trains I actually run, ruining the "collector's value" eventually anyway. 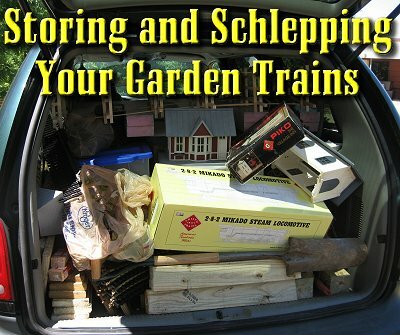 So once I found an alternative to keeping everything in those space-and-time-consuming boxes, I gave all the boxes to another garden railroader who was more finicky about resale value. 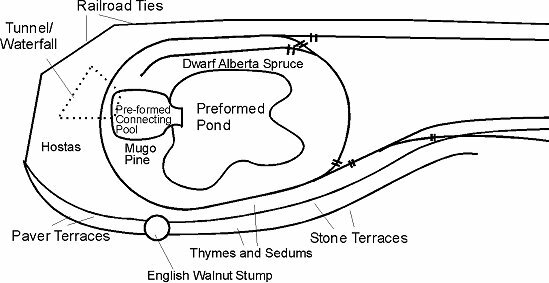 This section shows the way I find most helpful for transporting trains either from storage to the back yard or from my house to other people's houses. There are many variations on this them, of course, but this should get you started thinking. Start With the Trains You Usually Run - As much as garden railroaders like to talk about "model railroading outside," the truth is that most of us have all we can do to get some sort of train running on the track more than a few times each season. And most garden railroaders tend to run their favorite or most trouble-free pieces, usually in about the same combinations. In other words, we create our own "train sets," whether we think of it that way or not. Don't be embarrassed, nearly everyone does it. The reason we don't think of them as "train sets," per se, is that they come in separate boxes that we fiddle with every time we set our trains out. The short version is that it works better for me to pack the trains I run most often into a few containers I can schlep out quickly. 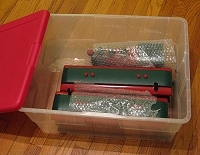 Using Packing Containers - I run mostly Aristo standard gauge stuff. The cars are a bit over 18" long with couplers, about 6/5" high and 4.25" wide. I discovered that Sterlite's most popular container, their 56 quart translucent storage box, is easily large enough to hold four of these cars, well-wrapped with thin bubble-wrap, with extra room for short cars, flat cars, power supplies, or accessories. (I average 5-6 cars per container, counting shorty and flat cars and gondolas.) If you have a lot of 1:22.5 stuff (like the cars that come with Bachmann train sets), your cars are almost as big and will travel just as well in these containers. 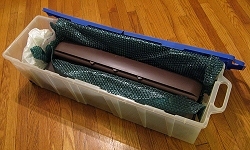 Also, since garden train cars are relatively lightweight, the average person can easily carry two of these boxes from storage to the railroad. Try carrying 10-12 cars at a time in the manufacturer's boxes without dropping something. And once the cars are set out, the containers stack inside each other so the yard next to your railroad doesn't have to look like a disaster area. My friend Wil Davis says he prefers the kind of container with lids that flip in and out, because you don't have to worry about keeping track of the lid. Also, Sterlite changes their products subtly every couple of years (for instance, the 56-quart container I've shown is now only available in 58-quart size) and the lids from one version to the next aren't always interchangeable. I like the translucent containers because you don't have to worry about labeling the containers, or a helper packing a train going into the "wrong" box. In case you wondered, I have most of my other cars and locomotives in similar storage; the Christmas trains just happen to be on top because those are the trains most likely to travel to other places. And as I write this article, I'm preparing for another Christmas-season open railroad. As a rule, during summer operations, I can easily get two or three trains with a total of a dozen or more cars running in just a few minutes with a just a couple trips between storage and garden. And trips to clinics or other display railroad situations are just as simple. As another benefit, these containers are excellent for off-season ("permanent") storage as well, as long as the material you use for packing is stable and doesn't contain pigments that will stain your train after a few months. Sterlite Containers Outside - Two summers ago, I left a small PRR Aristo train outside all summer long in an identical Sterlite container hidden around the "corner" from the most likely viewing condition. Except for some grime on the lid, both the PRR train and the container were in excellent condition at the end of the summer. That said, these containers are vulnerable to bitterly cold weather. The colder it gets, the more brittle the translucent vinyl gets, until the point, probably under 32F, at which dropping the container will cause it to break. Below 20F, they can shatter. So handle them carefully during cold weather. What About Longer Pieces? Okay, I'm a sucker for heavyweight passenger cars, and those things are BIG in Large Sale. You would think that those underbed storage units would be of help, but many of them are no deeper than a train car is wide. In some cases, they would actually limit you to a single car, not a good use of your resources or space. JoAnn Fabrics to the rescue! 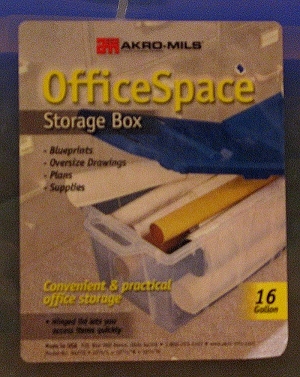 While I was casting about for a suitable container for schlepping my heavyweights, I noticed that JoAnn fabrics carried a 10" high, 11" wide, 36" long translucent plastic container that would work great - Akro-Mils #64272. As the label says, these were designed for blueprints and similar oversized business documents. But JoAnn's carries them for people who need to haul bolts of cloth around. As you can see in the photo, there is plenty of room for hauling three or more (depending on the manufacturer) heavyweights in a single container. When I'm using a lightweight locomotive like the Lionel Atlantic, I'll wrap it up and put it in with a couple of cars as well. Packing Material - I prefer to use thin bubble-wrap, clear when I can get it. Fortunately I work in the computer industry, where that's easy to come by. At least one friend uses the same kind of containers, but wraps his trains in old dishtowels. To me, the main advantage of clear bubble-wrap is that it's still possible to see through the side of the box and through the bubble wrap and get SOME idea of what is in the container. In some cases, when I was nervous about particular pieces (like heavy locomotives) shifting around, I have also cut pieces of corrugated cardboard to insert between the cars and between the layers of cars. Other Methods - There are nearly as many other methods for schlepping trains as there are garden railroaders. One of my favorite methods for moving a lot of cars at once with minimum hassle is used by Fred Mills. Fred runs his trains many times each summer, and he usually has several folks over each time, often as a club event, so he likes to set out a lot of pieces each time. The most important "take-away" from this article is that you should consider minimizing any barrier that keeps you from running your trains as often as you can all season long. I have about $80 invested in translucent storage containers, and I know folks who have $2000 or more invested in storage sheds. Hopefully, between these extremes, you should be able to find a system that works for your logistics and your budget. I'd be delighted to hear how you minimize the impact of "schlep" on your hobby, and would be especially grateful for photographs. Please contact us with suggestions, corrections, etc. And, above all, enjoy your trains.